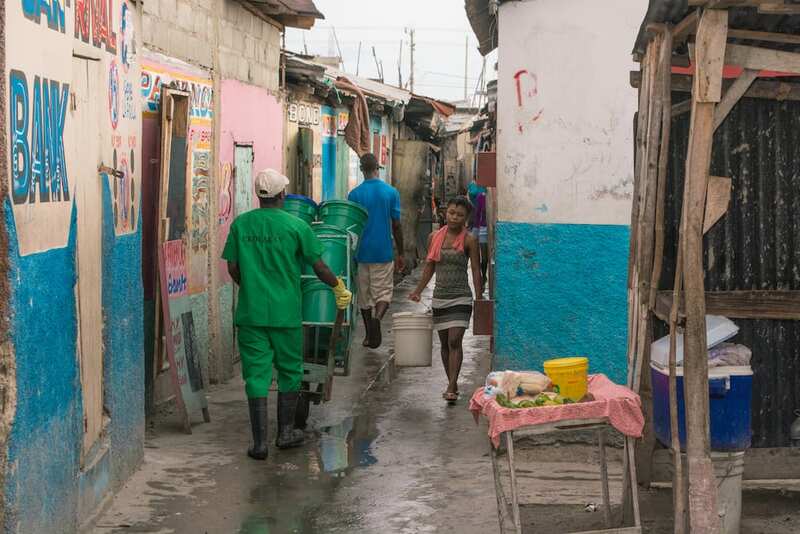 At SOIL we’re growing a sanitation service in urban Haiti that is setting a global example for how to affordably and sustainable provide safely managed sanitation in rapidly growing urban communities. And we’re extra excited that we’re not the only ones doing this. 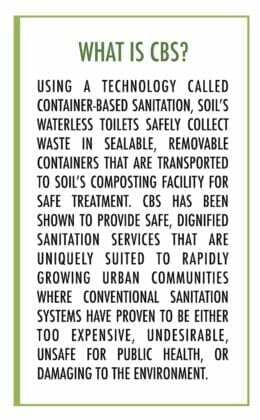 SOIL is a member of the Container-Based Sanitation Alliance (CBSA), a group formed in 2017 to help address the change of urban sanitation globally by supporting CBS technologies in being adopted by municipalities in their efforts to provide city-wide sanitation. SOIL frequently works with the CBSA to share lessons learned and best practices in order to inform the work of our partners while also improving our own implementation in Haiti. Last year, three members of the Container Based Sanitation Alliance (CBSA), SOIL, Clean Team (via their partner entity Water and Sanitation for the Urban Poor), and x-runner, commissioned EY’s Enterprise Growth Services (EGS) team to conduct a comparative cost analysis to better understand the cost drivers of CBS services in three different contexts and to explore possible paths to improved cost-effectiveness. Over several months, SOIL, Clean Team, and x-runner worked with EY to comb through cost and revenue reports in order to arrive at the closest possible apples-to-apples comparison possible in looking at each enterprise’s financials. Today we’re delighted to announce that the results of this comparative cost analysis are in! Before we dive into the results from the cost comparisons, how do the CBS providers that participated in the study compare? We all have relatively similar service models, each adapted to the unique conditions of their service areas. + SOIL – As loyal SOIL blog readers will know, SOIL works in urban Haiti serving household customers in Cap-Haitien and Port-au-Prince. SOIL uses a locally manufactured ferrocement toilet that contains waste in plastic sealable containers which are collected weekly, and then washed and recirculated after use. SOIL provides locally sourced organic cover material (waste from sugar cane and peanut processing) used in place of water for flushing. SOIL operates its own treatment facility, transforming waste into compost and selling it locally. + Clean Team – Clean Team services households in Kumasi, Ghana using a specially-designed imported plastic toilet which, similar to SOIL’s toilet, contains waste in plastic sealable containers which are washed and recirculated after use. Clean Team and SOIL have both adopted a 3-stage transport model to address the challenging road infrastructure in their respective dense urban areas. This model can be summarized as: 1) door-to-door collection of containers by small motorized vehicles, 2) use of transfer stations for temporary storage of containers, and 3) secondary transport of containers to and from the waste treatment facility using larger trucks. Unlike SOIL, Clean Team disposes of its waste at a centralized, municipal-owned treatment facility managed by a separate waste management enterprise. + X-runner – Services households in Lima, Peru using an imported plastic toilet commercially available from a European manufacturer. X-runner lines its containers with biodegradable bags to facilitate pick up and reduce cleaning needs. X-runner also offers locally sourced cover materials used in place of water for flushing, with slightly different strategies to minimize odors. In comparison to SOIL and Clean Team, x-runner has adopted a single-stage, sub-contracted, ‘customer drop-off’ transport model reflecting customer and access characteristics within their context as well as the need for a special permit for transporting waste. Similar to SOIL, x-runner than treats and transforms the collected waste into compost. Comparatively, SOIL’s locally manufactured ferrocement toilet had the lowest capital and depreciation costs, with no reported difference in impact on service quality or customer satisfaction. While the capital cost of x-runner’s toilet was higher, it had a longer lifespan and thus a lower annualized cost compared to Clean Team’s. Clean Team and x-runner have an advantage in production capacity as their toilets can be mass produced and are not constrained by the production capacity of informal local producers. SOIL chose a locally produced model as a means for generating livelihood opportunities in the neighborhoods where they work as well as out of necessity given extreme challenges with importation of externally produced materials into Haiti. X-runner was able to charge the highest absolute service fee to its customers at USD 12.00 per month. However, the service fee paid over one year represented only 1.15% of Peru’s gross national income (GNI) per person per annum, compared to Clean Team’s 2.48% of Ghana’s GNI. Clean Team’s ability to charge the highest fee compared to GNI is mainly due to Kumasi’s context where customers are used to paying (high willingness to pay) for sanitation as they are typically converts from pay-per-use public toilets which are more costly than the household service fee. SOIL, on the other hand, which charged the lowest service fee and operates in a context where paying for sanitation is not common (low willingness to pay), has a relatively competitive service fee at 2.15% of GNI. The impact of service fees and payment collection on the viability of a business is significant; for example, for Clean Team, a 1% increase in the fee or improvement in payment collection results in a 3% point improvement in the gross margin. Clean Team’s competitive margins were due in part to their higher payment rates which were achieved through mobile payments and an intentional push to increase customer satisfaction. Clean Team had the lowest direct costs, due primarily to their ability to transfer responsibility of waste disposal and treatment to the private operator of the municipal facility at no cost. SOIL and x-runner’s models have the added advantage of recovering resources from waste, producing a valuable soil amendment that mitigates climate change and supports agriculture. While this work presented an unprecedented comparison of key financial and performance metrics across CBS services, the report analyzed only three months of operations for businesses that are rapidly evolving. In addition, while EY did a considerable amount of work to standardize the way costs were assigned along the sanitation value chain and to extract valid and productive insights from their analysis, but some key differences in financial and performance indicator recording practices across the groups limited the ability to make direct comparisons. However, given the utility of the early findings pulled from this research, this project redoubled the commitment of the CBSA to work towards the continued standardization of key performance indicators and accounting practices to better facilitate future analyses and foster continued collaborative innovation in the sector. Ultimately, we are delighted to have participated in this study and grateful to all the people who worked to make it happen. With over 700 million people living in urban areas globally still lacking access to sanitation, we are committed to putting our heads together to come up with sustainable solutions. Want to learn more? Check out the full report here. No Replies to "Sharing Outcomes to Support Global Expansion of Sanitation Services"